As a yellowHEAD-empowered, pregnant working mother to two kids, I jumped at the chance to celebrate International Women’s Day by putting “An ASO Spin on Women’s Day”, (or A Woman’s Spin on ASO?). Since yellowHEAD’s ASO strategies cover both search optimization (getting found in search) and conversion optimization (A/B testing of graphic and creative assets in the store listings), we used these same ‘expert’ perspectives to look at Google Play apps specifically targeted at women and girls, comparing these to apps marketed to men and boys. By focusing on the target audiences rather than one specific app, we uncovered a few insights both about the store algorithm as well as gender-specific marketing trends. While the above data is for the specific terms ‘girls’, ‘boys’, ‘women’ and ‘men’ (for the purposes of this article), we see similar trends for other female-male keyword variations. For example, there is higher search traffic for mom-related apps than for dad-related apps. Our theory is that, generally-speaking, users consider ‘male’ search terms more as a default, whereas an app or game that is specifically for females is more of a niche market. In other words, the ‘men/boys’ is understood and included in general, non-gender specific search terms. Meanwhile, ‘female’ apps/games fall under a more specific grouping that is assumed to be difficult to find when searching the general search terms. Interestingly, we find supportive indications to this theory when looking at the apps presented as search results for these terms in Google Play. ‘Games/Apps for Girls’ brought results that were stereotypically feminine, with the keyword ‘Girls’ specifically targeted in the titles, Publisher IDs, and/or descriptions. 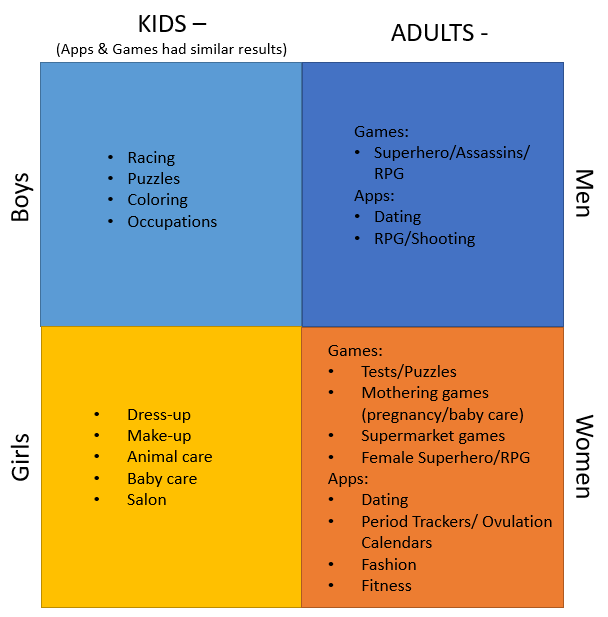 ‘Games/Apps for boys’, however, resulted in a more diverse selection of apps including keyword targeting of ‘kids’ and/or ‘girls’, but not necessarily ‘boys’. Since the Google Play search algorithm is such a sophisticated and complex unknown, we can only assume that there is a reason for the inclusion of the ‘girly’ apps in a ‘boyish’ search query, especially when there is no mention of ‘BOY’ whatsoever in these apps’ listings. Our theory is that Google Play treats terms like ‘Apps for Boys’ to include much broader intentions that extend to ‘kids’ generally, but also the specifically ‘boyish’ and ‘girly’ apps. If a user wants only the minority ‘girl’ apps in results, they must dig deeper with a more ‘girly’ search term. To further support this ‘default’ theory, we can look at the non-gender specific ‘games for kids’, where we see that people searching for ‘boyish’ games are most likely using the ‘games for kids’ search term, rather than a boy-specific search term. Meanwhile, people after girly games feel they need to specifically seek out that niche. If your target audience is girls, whether totally or as a major slice of the pie, your best bet it to target keywords that are both non-gender specific in addition to girl-specific so you get the best of both worlds. That said, generally speaking, users looking for a ‘girly’ app, are more likely to specify it in their search. On the flipside, if your target audience is entirely boys, you wouldn’t gain as much from targeting the ‘boyish’ keyword terms as you would if you targeted non-gender specific terms. Let’s put aside the extensive gender stereotypes we see in these search query results. Whether they are a reflection of the target audiences’ interests or a reflection of out-of-touch marketers is difficult to review in an ASO blog post  . Instead, we decided to focus on overall visual trends employed when marketing apps to specific genders. Icons use overly-exaggerated white, female faces, with lots of pink and purple so that these icons are easily-identifiable to whom they are aimed. Interestingly, the repetition of themes is so wide-spread that the one app, CGH, that doesn’t follow the trend is the one that stands out best. Dating apps aside, ‘womanly’ apps like period trackers and ovulation calendars tend to include flowers and/or pink and red colors. Dating apps and Pacman apps aside (since they probably appear more due to the title rather than the target audience), the RPG/shooting games tend to be dark, with a focus on one face or character. The most diverse in topic, apps for boys has a hodge-podge of designs compared to the above. 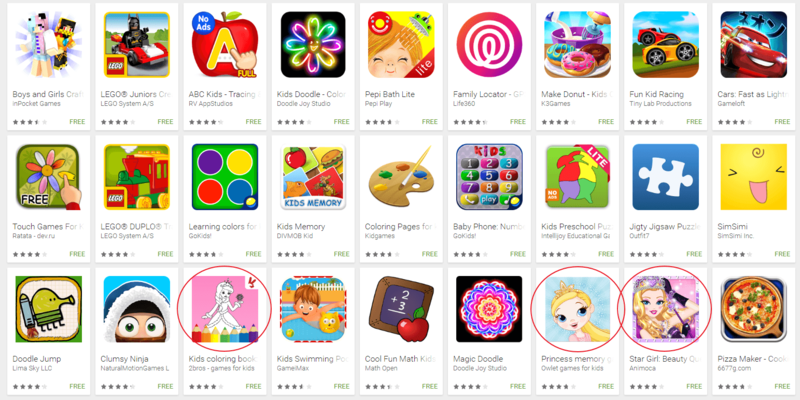 Of the kids’ apps, none of the icons seem particularly boyish to the point of ‘excluding’ a girl audience. The closest thing to a ‘boy’ concept here is the icon design with trucks and vehicles (which my 3-year old daughter would easily find equally exciting!). The above trends are interesting to observe. They generally play upon gender stereotypes which may or may not convert as desired. A/B tests are the way to go to be sure! It is also important to remember that, while you want to be identifiable by your target audience/gender, you also want to stand out (e.g. from the sea of pink that marketers have been swearing by) in order to peak user curiosity for ‘something different’ (or maybe ‘something less stereotypical’). We’ve looked at both search data and design trends for different target gender demographics. One can conclude we still have quite a way to go in terms of educating our little girls, but this is also a reflection of how we – the Google Play users and Google Web searchers – see girls and women as members of a specific niche, rather than the majority demographic in the world. From an ASO perspective, we might want to broaden our strategies and not be scared to target the bigger, non-gender specific terms, A/B test some gender-neutral colors, and step out of the stereotypes.